Fig. 1. Biosynthesis pathway for NO and nitrosothiols. Nitric oxide (NO ) is synthesized from l-arginine by NO synthases (NOS). One NO redox form, the nitrosonium ion (NO+), can activate by S-nitrosylation an array of target proteins (such as the cyclic nucleotide-gated channel represented here) either directly or via the formation of intermediate nitrosothiols (R-SNO). The CNG channel can also be activated by cGMP produced after the stimulation of guanylyl cyclase activity by NO . 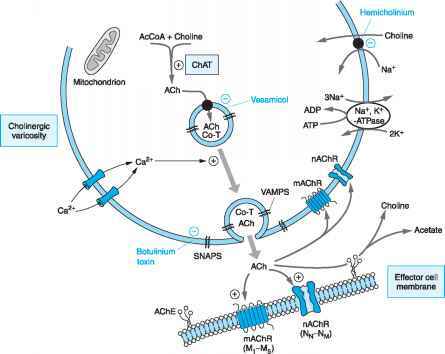 This chapter includes a detailed description of the biochemical, molecular, and electrophysiological methods that we have used to study and identify the mechanism involved in the direct activation of the olfactory CNG channel by cysteine-nitric oxide (NO) interaction. CNG channels form a family of nonselective cation channels that are structurally related to voltage-gated channels, but that require the binding of either cAMP or cGMP for activation.10 Although they have been identified in an assortment of cell types and tissues, they are most prevalent in the peripheral sensory receptor cells of the visual and olfactory systems, where they play a crucial role in transducing sensory information into changes in membrane potential. 10 W. N. Zagotta and S. A. Siegelbaum, Annu. Rev. Neurosci. 19, 235 (1996). Fig. 2. Hypothetical model of the two-dimensional architecture of a cyclic nucleotide-gated channel subunit. S1-S6 are the putative transmembrane domains, and P is the putative pore region. The cyclic nucleotide (CN)-binding site is defined by homology to the sequences of cAMP- and cGMP-binding proteins. The asterisks (») indicate the positions of the cysteine residues in the olfactory CNGA2 subunit. The putative NO target sites are the cysteine(s) located intracellularly (C460, C484, C520, and C552) that have been successively mutated into serine residues. Reproduced with permission from M.-C. Broillet, J. Biol. Chem. 275, 15135 (2000). In olfactory neurons, the channel is probably a tetramer formed by the assembly of three different types of subunits called CNGA2 (principal, or functional subunit) and CNGA4 and CNGBlb (modulatory subunits).11 This channel can be activated by either cAMP or cGMP, although it is generally believed that under normal physiological conditions it is a rise in intracellular cAMP that is responsible for channel activation.12 However, because of their sensitivity to cGMP, NO has been proposed as a signaling molecule in the olfactory system13 and in the visual system.14 In this model, NO activates a soluble guanylyl cyclase, producing cGMP, which then activates the ion channel (Fig. 1). However, we have shown that NO is able to activate the CNG channels from olfactory neurons in a cGMP-independent manner, providing a possible alternate pathway for channel activation by NO. 11 M. J. Richards and S. E. Gordon, Biochemistry 39, 14003 (2000). 13 H. Breer and G. M. Shepherd, Trends Neurosci. 16, 5 (1993). 14 D. E. Kurenny, L. L. Moroz, R. W. Turner, K. A. Sharkey, and S. Barnes, Neuron 13, 315 (1994). Electrophysiological patch-clamp recordings should be performed under the inside-out configuration.15 Electrodes are fabricated from thin-walled borosilicate glass (World Precision Instruments, Sarasota, FL) and fire polished to tip resistances of 10 to 20 MQ. The pipette solution is the same as the Ca2+-free solution (see below), so that both faces of the membrane patch are bathed in symmetrical solutions. The Ca2+-free solution contains (in mM) NaCl, 145; EGTA, 0.5; EDTA, 0.5; HEPES, 10; pH 7.6. Single-channel currents are recorded with an Axopatch ID patch-clamp amplifier (Axon Instruments, Foster City, CA) and stored on digital audio tape (DAS 75; Dagan, Minneapolis, MN). Signals are played back, digitized, and stored on a Power Mac G4 using the software Acquire (Instrutech, Great Neck, NY). The filter bandwidth is 0 to 2000 Hz and the sampling interval is 100 /xsec. The signals can be analyzed with the software programs MacTac (Instrutech), pClamp 6 (Axon Instruments), and Igor (WaveMetrics, Lake Oswego, OR). Channel detection is by the 50% threshold protocol. All recordings are performed on isolated rat olfactory neurons or transfected HEK 293 cells (see below). The recordings are made at room temperature. The dissociated cells are then maintained in normal Ringer's solution (NaCl, 135 mM; KC1, 5 mM; CaCl2, 1 mM; MgCl2, 4 mM; HEPES, 10 mM; glucose, 10 mM) and transferred to concanavalin A (1 mg/ml; Sigma, St. Louis, MO)-coated coverslips for recording. During electrophysiological recordings, a Ca2+-free solution is used (NaCl, 145 mM; EGTA, 0.5 mM; EDTA, 0.5 mM; HEPES, 10 mM; pH 7.6). ,5 O. P. Hamill, A. Marty, E. Neher, B. Sakmann, and F. J. Sigworth, Pflugers Arch. 391, 85 (1981). 16 J. W. Lynch and B. Lindemann, J. Gen. Physiol. 103, 87 (1994). Instrument, Hamden, CT) positioned close to the membrane patch. This rapid perfusion system is computer-controlled by the software Pulse (HEKA Elektronik, Lambrecht, Germany) and has a mean rise time in response to a solution change of ~29 msec. NO donors or releasing agents are used increasingly in in vivo or in vitro studies to mimic the effects of NO. A number of them are commercially available [Cayman Chemical (Ann Arbor, MI) and Alexis (San Diego, CA)]. We use the S-nitrosothiol: S-nitroso cysteine (SNC) as NO donor because it is not expensive, easy to prepare, and reliable. Moreover, it probably represents a common in vivo donor of NO because the most abundant source of free thiol groups in mammalian tissue is cysteine (in either the free or peptide form). SNC must be prepared on ice from the combination in acid solution of equimolar amounts of L-cysteine hydrochloride and sodium nitrite17 (Sigma). SNC is formed quantitatively within 1 min. The result of this acid-catalyzed reaction is a red liquid. The stability of SNC is greatly influenced by ambient conditions including pH, oxygen tension, and contaminant metals. The stock SNC solution remains effective for approximately 2 hr. 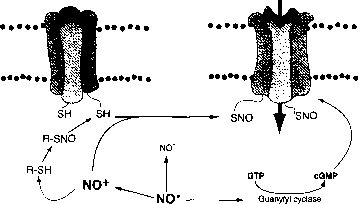 The mechanism of NO release from SNC is assumed to involve its spontaneous photochemical degradation from two molecules of SNC to one cystine and two NO molecules. Cyclic adenosine 3': 5'- monophosphate (cAMP) and the SH-modifying agents iodoacetamide (IAA), N-ethylmaleimide (NEM), dithiothreitol (DTT), and 5,5'-dithiobis-(2-nitrobenzoic acid) (DTNB) are obtained from Sigma. It is necessary to verify first the presence of CNG channels in the patch. Therefore, cAMP (20 or 500 pM) is perfused as a control on every patch. cAMP is then rinsed away and another drug (SNC, IAA, NEM, DTNB, or DTT) can be perfused. There should be no GTP or ATP in any of the solutions in order to demonstrate that the activation by NO is due to a direct effect on the channel. The experiments can also be performed in the presence of guanylyl cyclase inhibitors. NO donors such as SNC are then perfused on patches containing CNG channels and the precise electrophysiological characteristics of the activated channels should be measured. In the case of the olfactory CNG channel, the single-channel conductance and the mean amplitude are similar for cAMP or SNC. Amplitude histograms are nearly monotonic in the presence of either cAMP or SNC. Thus, it appears that SNC and cAMP are acting on the same population of channels. Moreover, the NO donors can open the channels in the complete absence of cyclic nucleotides. 17 S. Z. Lei, Z. H. Pan, S. K. Aggarwal, H. S. V. Chen, J. Hartman, N. J. Sucher, and S. A. Lipton, Neuron 8, 1087 (1992). When observed on isolated patches of membrane, NO donors such as SNC induce channel activity that is only slowly reversible, with occasional channel openings occurring for up to 30 min after removal of the drugs, suggesting that a persistent modification of the channel has been caused by NO. To show that the effects observed are dependent on the production of NO, inactive NO donors (i.e., solutions of SNC more than 24 hr old) should be checked on patches containing CNG channels, as well as the effects from the by-product cystine (100 ¡jlM) or 100 ¡iM cysteine alone. It should also be possible to mimic the effects of NO donors by SH-modifying agents. The membrane patches can be exposed, for example, to iodoacetamide (IAA). In Fig. 3, application of 2 mM IAA produces immediate channel openings with activity similar to that observed after the addition of SNC. The effect of IAA is not reversible. When SNC is added together with IAA no increase in channel activity is observed, suggesting that these two substances may be activating the CNG channel by the same mechanism. As with SNC, when CNG channels are absent from the patch, as determined by the failure of saturating cAMP to activate a conductance, no effect of IAA can be observed. Experimental results of this type rule out the possibility that IAA, even at the high concentrations used here, activate a nonspecific conductance producing an increase in the patch permeability. 18 F. H.J.White, ¿«"Reduction and Reoxidation at Disulfide Bonds" (C. H. W. HirsandS. N. Tinasheff, eds. ), p. 481. Academic Press, San Diego, CA, 1972. 19 G. L. Kenyon and T. W. Bruice, in "Novel Sulfhydryl Reagents" (C. H. W. Hirs and S. N. Timasheff, eds. ), p. 407. Academic Press, San Diego, CA, 1977. 20 P. C. Jocelyn, in "Spectrophotometric Assay of Thiols" (W. B. Jakoby and O. W. Griffith, eds. ), p. 44. Academic Press, San Diego, CA, 1987. 21 P. C. Jocelyn, in "Chemical Reduction of Disulfides" (W. B. Jakoby and O. W. Griffith, eds. ), p. 246. Academic Press, San Diego, CA, 1987.